Indestructible Man – Inhuman! Invincible! Inescapable! 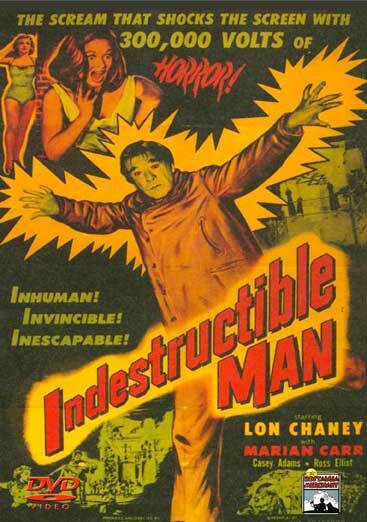 Indestructible Man stars Lon Chaney as “Butcher” Benton who is executed in the electric chair, but a mad scientist’s experiments revive him as an unstoppable killer endowed with super-human powers, impervious to bullets or other weapons. “Butcher” Benton goes to his death in the state prison, cursing the three men who double crossed him following an armored-car hold-up; “Squeamy” Ellis, Joe Marcelli and Paul Lowe, his attorney and leader of the gang. “Butcher Benton” dies without revealing the location of the stolen money. But he vows to return and get revenge on the double crossers. Detective Chasen is determined to keep working on the case until the stolen loot is recovered. Benton’s body is taken to Professor Bradshaw and his assistant for experimentation, and they manage to restimulate Benton’s heart, and he revives mad, mute, immensely strong and with skin virtually impervious even to bazooka shells. He sets out to avenge himself on the two henchmen who, in collusion with his attorney, betrayed him in order to steal his loot. Benton takes to the sewers to recover the hidden loot and the police are powerless to stop him. 1956 – BW – 70 Minutes. DVD, Digitally remastered. Also starring Max Showalter.